Click on specific schedules below. Town route fare is 25¢ per boarding. Work express fare is 50¢ per boarding. College routes are public routes and open to anyone who wants to ride. Fare for public riders is $1.00 per boarding. College route fare is FREE for college students and staff/faculty who present college ID, seniors at least 60 years old, and children 5 or younger who are accompanied by an adult. At your request, the bus can stop at other locations that are along its route. This is a route deviation service. We will deviate up to 3/4 of a mile off our fixed routes for all passengers. Please call at least 48 hours in advance with your requests. Schedules are based on the bus’s average speed and the distance between major stops. Arrive at the bus stop several minutes before the scheduled pick-up time. Because bus arrival times are approximate and vary depending on traffic, construction, accidents, or weather conditions, please plan for the possibility that the bus may arrive up to ten minutes before or after the scheduled pick-up time. 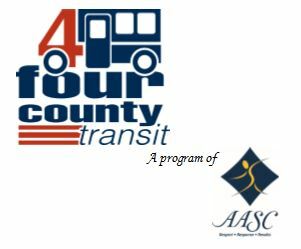 Copyright © 2019 Four County Transit. All Rights Reserved.